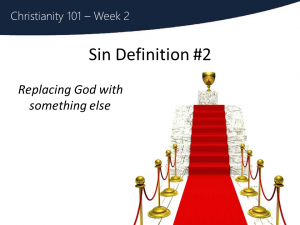 We look at a second definition of sin, as replacing God with something else. Question: How does this view of sin differ from how you thought about sin before? From the Bible: Read John 5-6 and reflect - what kind of power does Jesus have? What does he say he can do, and what does he do? We look at a second definition of sin, as replacing God with something else.When we read the Bible we begin to see that in fact the primary way to define sin, is not only the doing of bad things, but it is rather taking things that are good and giving them ultimate significance. It is about replacing God with something else.Sin is about freely chosing to center our lives on anything but God…..be it human approval, financial success or self control..the list of good and valuable things vulnerable to abuse goes on. They can even be good things. When we turn these good things into ultimate things, taking them out of the context for which they were created, then we are on a dangerous and destructive path. Sin is anytime we take something in this world, pretend that it’s the ultimate good, which makes it very bad for us. At a conference, I met a pastor from the US and his friends, and got chatting. This was a pastor who had spent some time in prison, was now a pastor, and had all sorts of tattoos. The guys with him were asking about the stories behind each tattoo, but then the conversation turned to his wife’s tattoos, that included an opium poppy. He explained that the opium poppy was an important symbol of her life. Poppies are a beautiful flower, a good thing. But people have used and abused poppies to make opium and other drugs that destroy lives. This was the story of her life – something that God had created to be good and beautiful, that she and others had abused her in all sorts of destructive ways…taking drugs, using her sexually, and more. It’s the same with many of the good and beautiful things God created – when we abuse them, taking them out of the context for which they were created, that is sin. Sin is whenever we are centering who we are and what our life is, on things other than God. And we’ve all done that. How does this view of sin differ from how you thought about sin before? Read John 5-6 and reflect – what kind of power does Jesus have? What does he say he can do, and what does he do?